A good old classic shot for the scrapbook. So what were we up to? Well Gareth (the monkey) pictured with a mallet and pint in hand invited us all to a classic animal party in November 2004. Well you can imagine what happened. 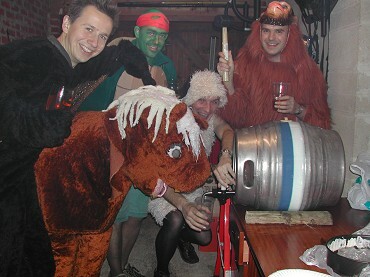 We all obviously turned up dressed as a rather odd collection of wild animals and amongst other beverages consumed a barrel of ale care of Hywel (the horse). Pictured also are Jim the bat, Tim (or Tony P as he's know by some of us) the mutant ninja turtle and me dressed as a sheep pouring myself a nice pint of ale. 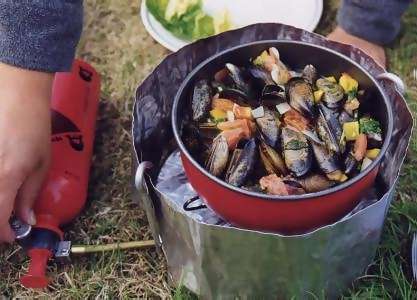 Well, I love travelling, whether it is around the country or further afield to Europe and beyond. It's probably the geographer in me that gives me that constant urge to escape from life in the city and explore beyond the edge of the concrete jungle. Below is certainly one of the more unusual situations that I've been in in a foreign land. My old friend Paul and I decided to take a cheap flight to Germany in January 2000 to look up Frauke who spent a year over here in Birmingham. Germans are known for enjoying their beer. 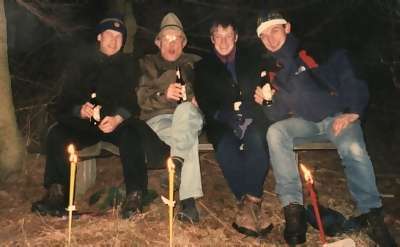 The scene below shows Frauke's brother, dad, Paul and I in some woods on top of a hill around midnight somewhere in the middle of Germany walking by candlelight. We'd paused for a few minutes to consume another fine German beer on a seat overlooking the village of Feudingen. German beer by the way is miles better than the fizzy lager rubbish that they serve in this country. Well worth a visit to go and try it! Um, well I guess I was a little bit crazy while I was in Norwich. Maybe it was the flatness of the county and the fact that it is still to this day somewhat cut off from the rest of the country, but I errr. 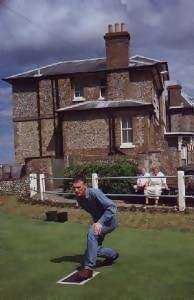 took up morris dancing and for the time I was there rather enjoyed it! Nobody believes me now! Maybe it was just a dream? I also enjoy mountain biking, cooking!, a little salsa and skiing and errr. climbing to the top of big old castles and, oh yes, walking up to the bar & generally help keep quite a few good pubs in business, but I can't call them 'good' pubs cos the bloke that publishes that pub guide will send me another threatening E-mail!.... Oh, and a little gardening and whatever else people persuade me to do (within reason). 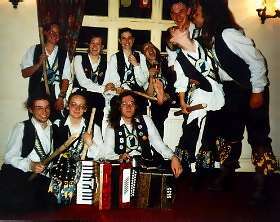 If you're very bored why not take a peek at my morris dancing and good pub internet pages. I'm quite keen on photography these days. Visited the Severn Valley Railway on 16/3/02 and took some photos which you might like to view here. They were taken with a Nikon Coolpix 885 digital camera.